"I've never seen anyone in love with the tenor saxophone the way Sonny is. He's the best player of that instrument I've ever seen." Sonny Rollins first learned piano, studied alto saxophone from about the age of 11, and took up the tenor in 1946. In high school he led a group with Jackie McLean, Kenny Drew, and Art Taylor. He rehearsed with Thelonious Monk for several months in 1948, and from 1949 to 1954 recorded intermittently with a number of leading bop musicians and groups, including J.J. Johnson, Charlie Parker, Fats Navarro, Bud Powell, Max Roach, Art Blakey, Monk, and the Modern Jazz Quartet. His most frequent associate during these early years was Miles Davis, with whom he performed in clubs from 1949 and recorded from 1951. In 1954, [on Davis's Bag's Groove, Prestige] he introduced three compositions of his own which later became jazz standards: "Airegin," "Doxy," and "Oleo." In 1955, while overcoming his dependence on drugs, he worked in Chicago and, in December, joined the Clifford Brown--Max Roach Quintet. He remained with Roach until May 1957, then performed briefly in Davis's quintet; thereafter, however, he has led his own groups. During the years 1956 to 1958 Rollins was widely regarded as the most talented and innovative tenor saxophonist in jazz. Nevertheless, he was discontented and voluntarily withdrew from public life from August 1959 to November 1961. During this period of retirement his habit of practicing on the Williamsburg Bridge in New York became legendary. 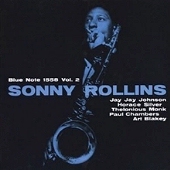 Except for a six-year retirement from 1966 to 1972, Rollins has remained active, touring the USA, Europe, and Japan, and recording a fusion of bop and soul music with his quintet. Rollins has adhered to the bop practice of varying and elaborating a large repertory of fomulas and, in a wide range of material, shows a rhythmic imagination, harmonic subtlety, and freedom of design that have perhaps been surpassed only by Charlie Parker. A selected discography of Sonny Rollins albums. With The Modern Jazz Quartet, 1951-53, Prestige. Sonny Rollins Plus Four, 1956, Prestige. Sonny Rollins, Vol. 1, 1956, Blue Note. Sonny Rollins, Vol. 2, 1957, Blue Note.